English Summary/英文概要： It’s Phil and Dale’s favourite time of the week - the WASH! The two socks impress each other with their acrobatics; flipping, spinning and shrieking, much to the disapproval of the other clothes in the washing machine. But why should they care? They’ve got each other and that’s all that matters... right? Written in comic book form, and brought to life in gorgeous crayon illustrations, this a tale of friendship and identity that will delight children and adults alike. Awards/获奖情况：KIRKUS STARRED REVIEW: A big round hole in the front cover invites readers to join the tumbling twosome in their exhilarating romp. 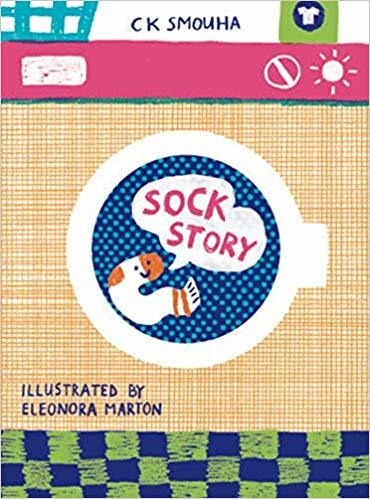 In the simply drawn, brightly hued illustrations, Marton dabs simple faces onto the tumbling, rumpled laundry, presenting the all-dialogue narrative and the clunks and gurgles of the washing cycles in block letters and adding hands and a flash of elbow, both pink, as the only signs of human agency. A well-knit tale of textile togetherness. Eleonora Marton is an Italian illustrator living and working in London. She is the author of DIY ABC (Cicada, 2016) and Bigger (Cicada, 2017). CK Smouha is a television writer and author living and working in London. She is the author of Born Bad (Cicada, 2017).